A bathroom vanity top is an important element of classic or contemporary bathroom design. Bathroom countertops are impactful, serve an important role in the space, and leave a lasting impression on the overall look and feel. 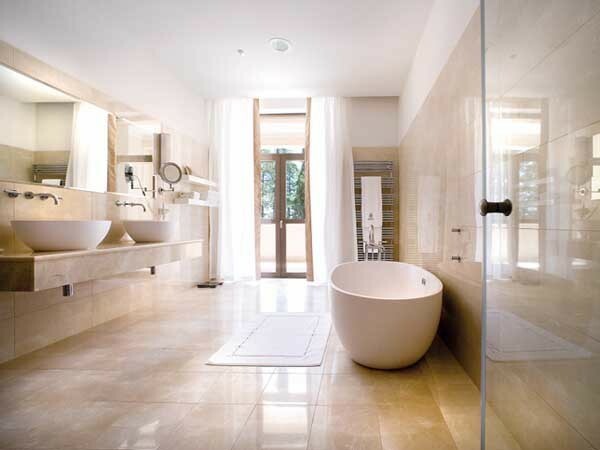 Bathroom vanity tops and units are high on aesthetic as well as function. Considered an important utility furniture item, a vanity unit is the most used space in a bathroom and has great visual appeal. Bathroom vanity units make bathrooms more functional and effective by providing storage space for supplies and keeping the bathroom clutter-free. While the vanity top adds style to the bathroom space, the unit brings the substance. The increasing popularity of bathroom vanity units and tops has led to almost unlimited choices in design options. Vanity units are available in various configurations including floor mounted and wall mounted models. Material options for bathroom vanity tops include wood, tile, marble, granite, laminate and solid surfaces. Vanity tops should ideally be able to resist water, soap, toothpaste and other materials. RMS Marble can assist designers, specifiers and homeowners put together the ideal bathroom vanity unit. Simply provide the exact dimensions of the bathroom and budget for the vanity unit and get stylish, yet practical suggestions based on RMS’ expertise.